Some people seem to be born to follow a particular profession and so it was for Archibald Johnston born to a merchant father, a burgess of Edinburgh, in March 1611. His grandfather Sir Thomas Craig was a advocate of note and the author of a book on Feudal Law. An aunt was the wife of Lord Durie and mother of the second Lord Durie; another uncle by marriage was Sir James Skene, President of the Court of Session. A grandmother Rachel Arnot, had hidden Robert Bruce the dissident minister of St. Giles and her house was the place of refuge for banished ministers. He was thus aware of both the law and Covenanters from an early age. In the protestation and tumult that arose following the introduction of the Service Book on 23 July 1637 very many representatives from all over the Lowlands of Scotland gathered in Edinburgh to petition the Privy Council. Johnston was responsible for coordinating this opposition and the creation of four permanent committees called “The Tables” made up of the best and ablest representatives from each of four categories. The first Table was composed of the nobility, the second of representatives from the shires, the third of members of the Presbyteries and the fourth of the burghers and townsmen. At the heart coordinating things was the “Central Table” which sat constantly in Edinburgh and negotiated directly with the Privy Council. Archibald Johnston was the Clerk and Secretary of the Central Table with a finger on all the pulses. Early on he was literally to deliver great work to the Assembly when he found the missing Kirk records from 1590. There had been great fears that these historic records had fallen into the hands of the bishops and may have been mutilated or destroyed. The restoration of these records was itself a minor miracle. With Alexander Henderson, the foremost and most statesmanlike of the Presbyterian ministers of his day, they framed the National Covenant. Henderson had came to notice when .he defended himself before the Privy Council for failing to obtain and use the New Liturgy when ordered to do so by the Archbishop of St. Andrews. He did so well that the concerns were reported to London. This skill and tact was the reason for his joining with Johnston in the drafting of the National Covenant. The Covenant was in three parts, the first reproduced the Old Covenant of 1581 sometimes called the Kings Confession; the second scheduled the enactments against Popery and confirmed the privileges of the Reformed Church; the third was an emphatic protest against the changes in the manner of worship, which had brought about the then current troubles. With the benefit of hindsight and countless examinations by scholars it might be said that the Covenant was a very clever document. It was both long and turgid and to the layman probably unintelligible, with over four thousand words and full of involved legal clauses. But the final part (see Appendix 5) concerning resistance to innovation and support for Law and Order was a trumpet call that could be recognised and subscribed to by all. So it was on 28 February 1638 that Archibald Johnston held up the Covenant in Greyfriars Kirk and read its contents in a clear and distinct voice so that all present might hear. The Glasgow Assembly of November and December 1638 brought him to the fore when they voted him, almost unanimously, to be the Clerk and he duly took the minutes of that momentous meeting. Despite the order from the Kings representative, the Duke of Hamilton, to disperse, the Assembly continued to work on. The previous Acts ratifying Episcopacy were annulled. The Service Book and the Canons; the Court of High Commission, and the Articles of Perth were swept away. Eight bishops were excommunicated, six more deposed or suspended and the National Covenant was confirmed. All this was overseen by Archibald Johnston. Soon he was discussing ways and means of supporting the Covenanter Army at Berwick and subsequently was much involved in the negotiations that brought to an end to the First Bishop’s War 18 June 1639. He and Henderson were again involved in the Treaty of Ripon, 26 October 1640 that ended the Second Bishop’s War. Charles seemed to have a grudging respect for Johnston remarking that “the devil himself could not make a more uncharitable construction or give a more bitter expression” and on leaving the Royal presence Johnston was bid “walk more circumspectly in time coming.” Despite these warnings Johnstone prospered and in 1641 was knighted and became a Lord of Session. Later he was one of the eight Scottish Commissioners that went to the Westminster Assembly. Under Cromwell he very reluctantly accepted office and was one of the Judges appointed to superintend the administration of the law in Scotland. This was well received by the populace because the Judges, four of the seven being English, had no truck for the corruption they found and which was rapidly cleansed. In 1657 he was restored to the dignity of Lord Clerk Register of Scotland, which, among other things, provided him with useful income needed to support a large family. He later joined the English Council of State. However, there was a coming storm as Charles II came to power intent on settling old scores for troublemakers such as Argyll and Warriston who were condemned for cooperating with Cromwell. On 14 July 1660 a warrant for Sir Archibald’s arrest was issued. It seems Sir Archibald had wind of what was coming and had escaped to the Continent. On failing to appear at the summons he was formally summoned by trumpet to surrender himself and a reward of one hundred pounds Scots to any one who might detain him. 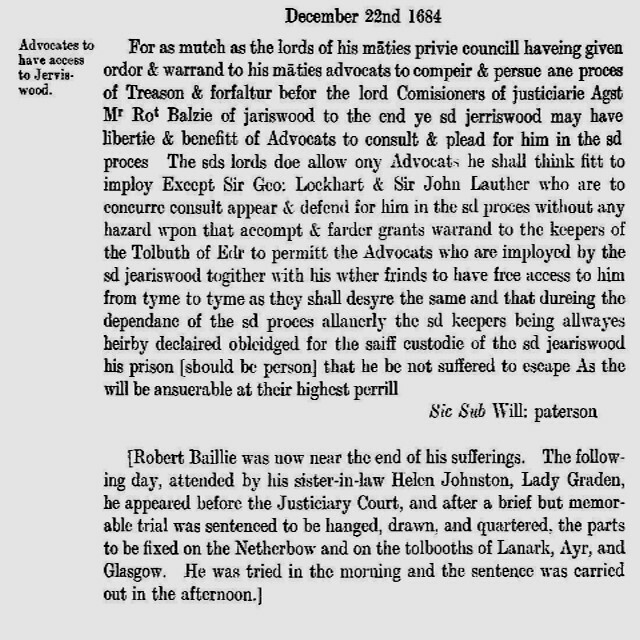 In an unusual step it was also declared to be treason for anyone to harbour or assist Warriston. On 10 October he was declared a fugitive In his absence and driven by spite, his offices were declared vacant and estates were forfeit. In February 1661 at the Mercat Cross in Edinburgh the Lyon King of Arms declared him a traitor and tore up his Coat of Arms. Warriston was forced to flee abroad. and then caused draw from him sixty ounces of blood … he was brought near the gates of death, and so far lost his memory, that he could not remember what he had said or done a quarter of an hour before.
. After two years he went to Rouen, France to meet his wife but in January 1663 was seized by one Andrew Murray and taken to imprisonment in the Tower of London, before removal to the Edinburgh Tolbooth in June. On 8 July he was arraigned before the Parliament at which the hearing and sentencing were almost perfunctionary. Warriston`s nephew, the historian Bishop Burnet, wrote that he was so disordered both in body and mind, that it was a reproach to any government to proceed against him. 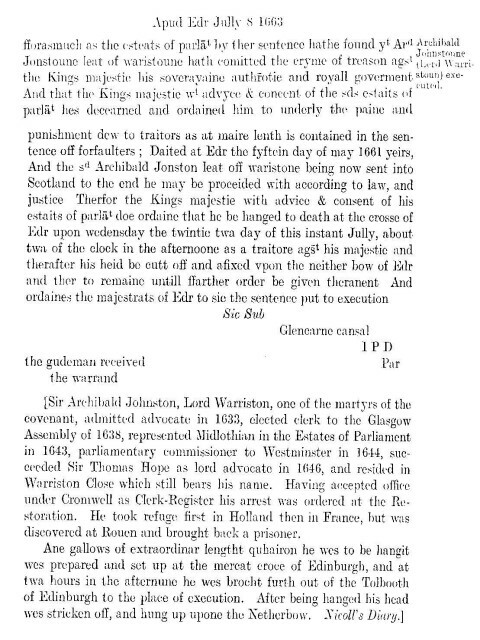 Warriston clearly was in desperately poor health and unable to defend himself and a vote was put to defer any sentence but John Maitland, Duke of Lauderdale, aided by Archbishop Sharp and the prelates, finally got his way with his demand for immediate execution. Although allowed a fortnights grace in which to prepare himself, Archibald Johnston was led to the gallows on 22 July 1663. In a final twist the gallows were erected opposite his own house where, with arms uplifted to the sky, he stepped forward to receive the martyr’s diadem. His head was cut off and displayed at the Netherbow Gate alongside his friend the Rev. James Guthrie. The head was later removed following the intercession of Lieutenant General Drummond who had married one of Johnston’s daughters, and was buried with the rest of the body in Greyfriars Kirk yard. Another daughter of Warriston was Lady Graden who in turn was sister in law of Robert Bailie of Jerviswood. She accompanied Baillie when he was executed, hung drawn and quartered, on 23 December 1684 and witnessed the sorry affair with great fortitude.